13 October 2017. We have launched our new website today to replace the one that had served the Association since 2012. It’s a great benefit to any membership organisation to have a website that’s regularly and overtly refreshed with details of its activities and other interesting information. Curious visitors are encouraged to keep returning to see what’s new, and people are prompted to join the organisation because they can see the value in doing so. The DA has been ‘online’ since at least 2001 and our previous website went live in 2012 – our 150th year. It was an attractive and well-designed website, but five years on we wanted to expand our internet presence and it had several characteristics that would have made that difficult. So instead we have built an entirely new website planned from the start to be user-friendly, easy to maintain and extensible. Although remaining true to the DA house style, it looks very different from the old site, and unlike that site it will display well on mobile devices (an important factor today) and it will be possible for its readers to provide feedback. Development took several months of part-time work; we have replicated and extended the content from the old site and have retained its basic navigation structure via a new menu at the top of every page. Taking into account the Association’s purpose and membership profile we have not included any of the flashy effects that decorate many contemporary websites, concentrating instead on providing an experience that is not too far removed from the familiar process of reading a paper document. So if you think it looks a bit old-fashioned – then yes, this is intentional! a new Events system which displays all our events as a list or in a calendar format. Each event has its own page which can include as much information as desired and which can easily be updated if, for example, details change or the event becomes oversubscribed. up-to-date lists of “Upcoming events” and “Latest DA news” that are shown in the sidebar on the right of every page. Branches and Sections each have their own page (see the list here) under which they can add and maintain their own content (with the webmaster’s assistance). information about Devon (see below). After the website has bedded in we will look at providing further facilities such as online event booking, feedback forms to improve communication, and readers’ comments which can lead to online discussions. We will also consider the benefits of a members-only area and the use of the website as a hub for coordinating projects. 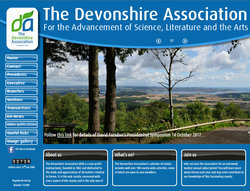 “investigating the dissemination of the vast quantity of material … about Devon in its paper Transactions”Historically, our website has almost exclusively dealt with matters relating to the DA itself, but there are good reasons to use it to host a wider range of information about Devon – see the new Devon page. We are investigating the dissemination of the vast quantity of material that the DA has generated about Devon in its paper Transactions. Other possibilities include short articles contributed by members, more blogs (if we can persuade anyone to write them! ), an audio pronunciation guide to Devon place-names, a Notes and Queries section, etc. We welcome suggestions for other uses.